The Mini-Golf Course at Chaika is located in the green and quiet garden of the famous open air Olympic sized swimming pool ‘Chaika’. It is an 18 hole mini golf court and a great way to spend some free time with friends and family in the open-air during Moscow’s warmer months. Located in the centre of the city, next to the popular Ostozhekna Street and within walking distance of the imposing Christ the Saviour Cathedral, the Chiaka mini-golf course is also a practical solution if you are looking for some active things to do in the centre of Moscow. When you are done with mini-golf and have grown a healthy appetite, a meal at the Kasbar restaurant located in the same garden with a lovely summer veranda, is certainly recommended. The restaurant is also known as ‘Oranzhereya’ and offers a mix of Arabic, Chinese, European and Japanese cuisine. 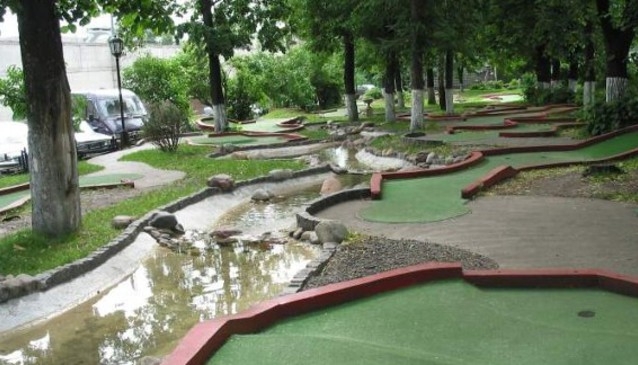 A round of mini-golf at Chaika will set you back around 200 rubles per adult per game, which is rather reasonable. Only Russian rubles are accepted.